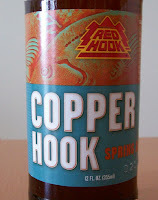 Seen a new beer (at least new to me) from Redhook the other day called Copper Hook. I used to enjoy Redhook on tap many years ago at the Thirsty Fox Pub in St. Charles, Ill. However, I haven't been as big of fan of the beer in recent years. Still, I thought I'd see what the brewery is up to these days and try this offering. According to the brewery, Cooper Hook is brewed with caramel and Cara-Pils malts, along with Willamette and Saaz hops. The alcohol content by volume is 5.7 percent. Poured from 12-ounce bottle into a straight-sided pint glass, the Copper Hook is a brilliant copper-colored ale. The fizzy carbonation created a brief white head that dropped to a dainty ring of bubbles. The beer smelled of a cheeseburger bun. Honestly, it had sort of a bready maltiness in the nose. The flavor was decent, crisp and lager-like with some toasted malt towards the finish and a light hop bitterness. Nothing really off-putting here (except maybe the odd hamburger bun aroma), but nothing that really makes me want to go out and buy drink a lot more of this beer. It's the kind of beer that I would grab at the airport, when I wanted a refreshing beer that was very drinkable, but not too boring. I think Copper Hook is a really drinkable beer that fits well into Redhook's portfolio of beers that may turn the macro beer drinker on to something with a little more flavor. I do believe it to be a touch strong though considering it's high drinkability. A few those could go down easy and before you know it you're head's buzzing. "Filled with mingled cream and amber, I will drain the glass again. Such hilarious visions clamber through the chamber of brain; quaintest thoughts, queerest fantasies come to life and fade away: what care I how time advances? I am drinking ale today." The beer I am tasting this evening is quite tasty stout; dark as night with perhaps a slight hint of ruby towards the bottom of the glass, a beige head that falls slowly, leaving clouds of foam behind and a wonderful aroma of burnt charcoal and espresso. 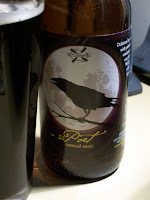 The flavors in this beer range from coffee with cream, to a slight port-like character, then a vanilla accent leading to a roasted coffee finish laced with a little tannin and a drying bittersweet finish. I hadn't tapped my Party Pig of red ale in a few days, so I went to pour myself a pint...but the button on the front wouldn't move...so I took the Pig out and placed it on the counter to get better leverage and out sprayed the beer. I managed to capture a mug's worth before the tap sputtered out, spraying yeasty sediment into the sink. The Pig was done, so I started loosening the screws on the collar as if removing the head from a drum, until I eventually had all the screws loosened. I noticed the pouch was protruding a bit from the container when all of sudden....POP! Like a ballon, the pig pouch popped, without any assistance, and sent itself flying off the counter and then landing in the cat's food bowl, but not of course, before taking some bottles on the corner with it, which went crashing to the floor. Wow. With the accident cleaned up I'm know wondering if it's too late to brew a small two and a half gallon batch of Irish-style stout for St. Patrick's Day. I think I can do it if I keep it low-alcohol (between 3 and 4 percent) and I brew it sometime in the next week. I filled 43 12-ounce bottles with the Berliner-style weisse today, after more than two weeks of secondary fermentation with the dregs of a bottle of 1809 Berliner Weisse (see earlier post). The dregs of the 1809 didn't seem to add any sourness, so added a couple tablespoons of 88 percent lactic acid solution (cheating, I know). I'm planning on letting this beer sit for awhile (at least three or four months) before I seriously entertain the thought of enjoying it. So far so good with this batch; the lactic character is certainly fairly strong, although actually sourness is muted. The beer is light and drinkable and the hops are not noticeable, so I got that part right. I think the next time I try something like this I'll try and get my hands on an actual Lactobacillus culture and actually add some grain to the fermentation to get some more "wild" character in the beer. (I've been reading that a sour mash works well for a Berliner, but that an actual lactic fermentation is better.) I added three-quarters of a cup of priming sugar to this batch, so here's hoping I don't have any bottle bombs!